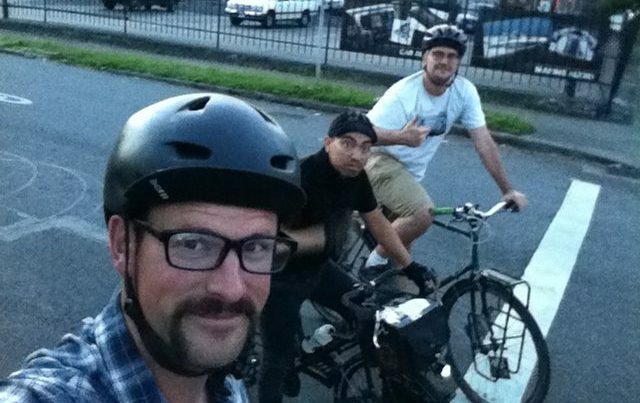 Brian Sysfail returns after a too-long-time to chat with us about Portland Autonomous Zone (PAZ), skillsharing, and the many great opportunities that Portland’s season of bike fun brings with the advent of Pedalpalooza! We discuss how to lead or participate in a group ride, some etiquette points, and the politics of cameras. Also: Brock rode 100 miles in 100 degrees, and Aaron rode a brompton around the horse track. And: lots of E300 goodies! Monologues, Heinz Stücke, Brother Dan, &Mechanic Dudebro. From PBJ Matt: Comes With Baggage, the documentary. Orange is able to hook up a friend with LA bike camping knowledge!